Every homeowner wants to sell their home for what they believe it is worth— and every prospective buyer wants to make sure they aren’t overpaying. Sentimental value can cloud a seller’s vision and buyers search for bargains. This is, of course, why we have the appraisal process. 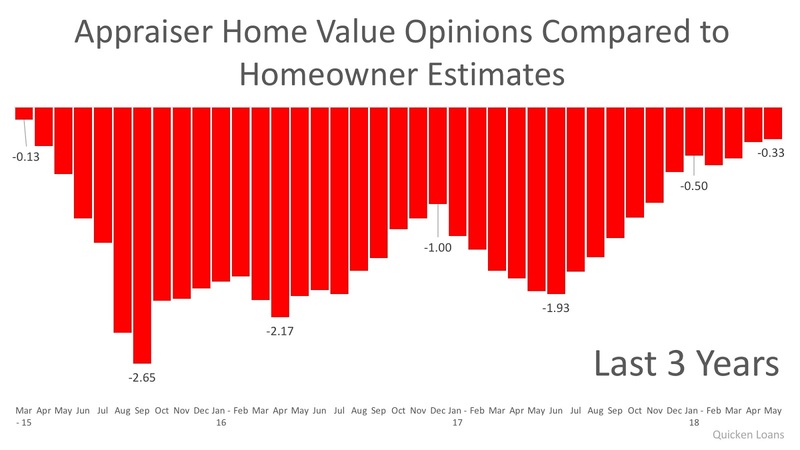 According to Home Price Perception Index (HPPI), which is a way to illustrate the disparity between listing price and the bank appraisal price, the disparity is the narrowest it has been in three years (since March 2015). The current gap is only -0.33%. This is important for homeowners who are looking to sell because this is the most eye-to-eye sellers and banks have been on the subject. To put this into perspective: .33% difference in appraisal could equate to thousands of dollars that a buyer or seller has to come up with at closing (depending on the price of the home). Bill Banfield, Executive VP of Capital Markets at Quicken Loans says, “…these differences affect everything from the type of mortgage a borrower can get to the expectations a seller has about the proceeds available upon sale of their home.” He urges everyone to research their local market; and how it’s been affected by supply and demand. Today’s market has a low supply and a high demand— causing home values to rise. With escalating prices that match bank prices, now is a great time to enter the housing market. If it is in your plans to list your home, let’s get together to sell your home twice (once to the buyer and once to the appraiser).